Here's my first journey into the realm of the Chaos Dwarfs. 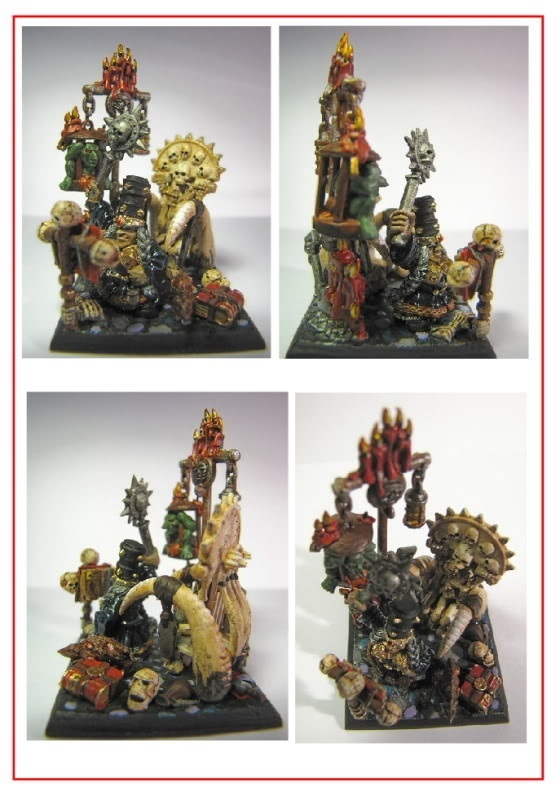 You've seen some of my conversion work on the "Conversions" page and now I've decided to put them into a Blog. So far I have the BFSP set and I've gotten as far as the first 6 warriors. I don't have much in the way of identical weapons for them, but I have enough of the skeleton shields to outfit 3 warrior units and the armour will have that "Diamond" look to it instead of the regular "Stacked Squares" look that most players use. I also want them to have a Quasi-Prussian look Cira 1914-1916. Even though they are somewhat individual, the overall look ties them in together visually. The warriors are going to have spiked helmets while the sorcerers are going to have the traditional tall hats. I'm not too sure about the Goblins at this point though. Anyway, here's some of the better pics so far. The Standard Bearer. Technically, because this warrior isn't carrying any weapons or shields, I could use him as a Battle Standard Bearer and equip his banner with magic. The unit's Champion with a captured Gnoblar tied to his back. The Champ is taking his captive back to the Temple of Hashut to become a slave to progress. The first Chaos Dwarf I built. Note that the beard is not very tight. The second warrior. I actually started this guy first in order to show a customer friend of mine how to make the wire coil beards for his BFSP warriors. I didn't finish him right away because I wanted to try the Greenstuff out first. This is when I started to make the beard coils tighter to match the look of the metal wire. His shield still has to be ground down and the Skull face attached. However, I do like the rounded shield look. 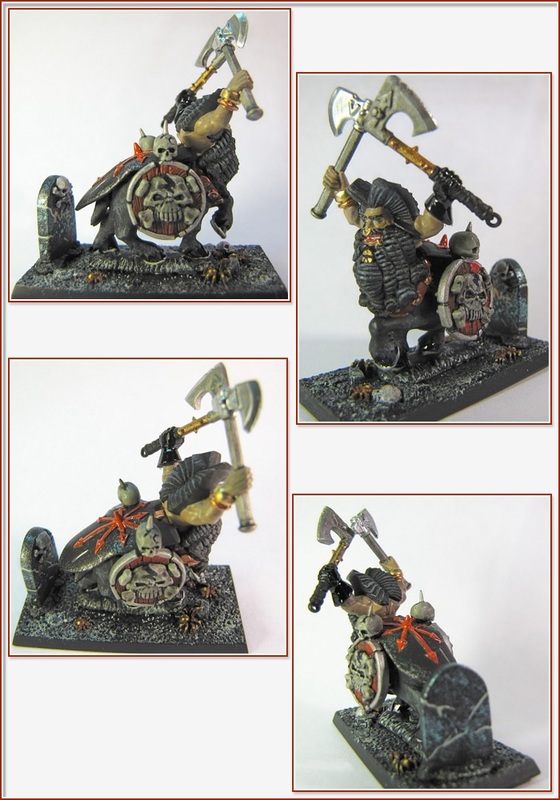 This is the Third Chaos Dwarf warrior. He's still holding a good Dwarf axe which I will have to replace with a Chaos weapon. This is the fourth Chaos Dwarf Warrior. He's made using the second style of BFSP warrior. Note the absence of the back pack located in the center of the previous Chaos Dwarfs. His armour is also wider across the shoulders. It was easier to make this guy's beard because it only required three Greenstuff Sausages. Hope you enjoied the first 6 progress pics. More to come soon! This post was last modified: 08-07-2017 12:51 PM by Admiral. Did I get that right: you are modelling the GS onto the wires? Or do you just attach them to get an idea of how it will look like? Looking gr8, keep it up. Like the dark humour in the champ, with the gnoblar on his back. Crossbows were good and fine, but nowadays, a gun is better - and if a gun is good, then an automated self-aiming gyro-mounted gun turret with a cyclic grenade feeder and napalm cannister is even better. I AM the anti-life, the bringer of doom and the ender of worlds. Where I go death arrives with me, and takes all in its path as I sit in glory revelling in the destruction I have wrought. The metal wires are actually drilled into that guy's head and the Greenstuff just caps them off so that the tops of the wire coils blend into his face. After I made this guy, I made sure that the GS beards looked as tightly spaced as the gaps between the red wire. I hope that makes sense. ThanX for the compliments Slavelord! 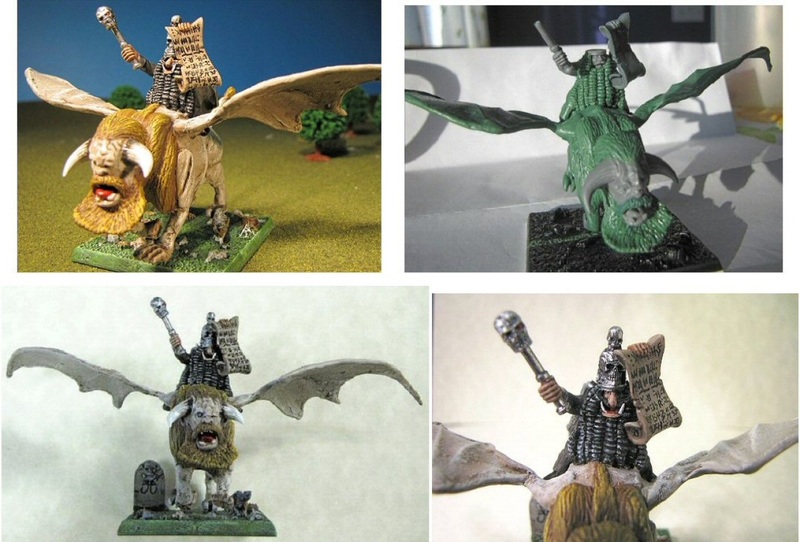 I just spent some time in the Basement re-configuring the 6 Chaos Dwarfs and getting the other 6 ready to join them. I made some discoveries, mainly that the spikes I was going to use on the helmets are too long and interfere with the weapons. However, I can still use the spikes on the 3 Command Crew. The Champion with his "Fat" spike, the Standard Bearer and the Musician, who is going to get a new arm and hand from the Good Dwarf sprue I have. Also, I replaced some of the weapons and gave the current 6 new weapons that matched one another. Now I have 3 Axemen as well as a Dwarf with a white Morning Star. 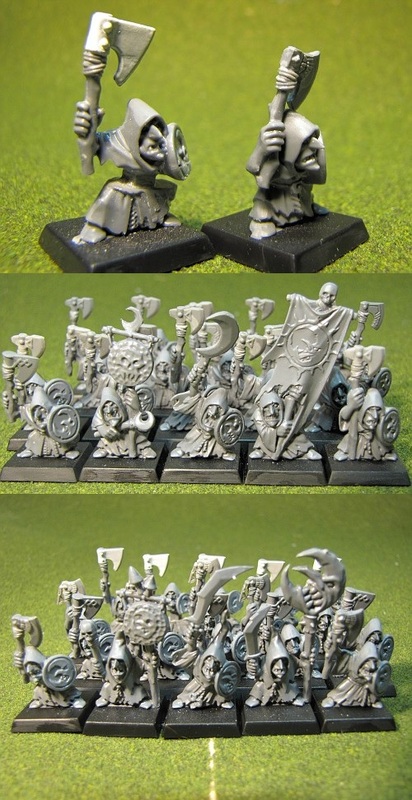 This Chaos Dwarf warrior unit will soon have 3 Command Crew with Spiked Helmets, 3 Axemen with high domed helmets, 3 Dwarfs with maces and 3 Dwarfs with morning Stars which will give them a +1 Strength bonus in the first turn of combat. I'll probably arrange the unit into ranks of 6 so that the Morning Star crew can stand beside the Command crew. I made a few slight modifications to my Command Group by adding the spike to the helmet of the Standard Bearer and giving Chaos Dwarf #4 the white morning star weapon. 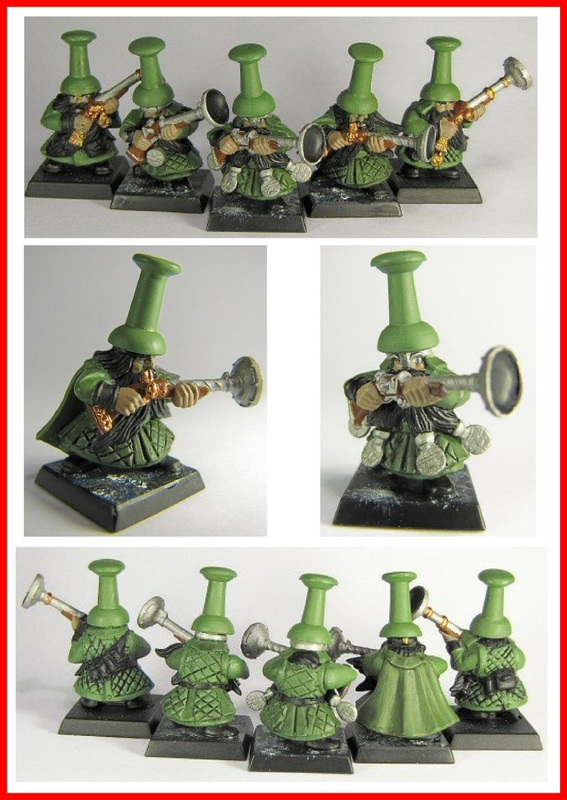 These are Chaos Dwarfs 1,2, and 3 with new weapons so that they match one another better. now we need to get you to pimp out the baces!!!! All in good time....all in good time! This post was last modified: 11-30-2008 08:03 AM by Hashut's Blessing. Why not just chrome plate the bases and add some gold effect for da Bling-Bling? Good idea for the Gutair strings, but I can't bring myself to the point of hacking up a good set of Ernie Ball Slinky Strings. This post was last modified: 11-30-2008 12:08 PM by Tarrakk Blackhand. ask your local bands to save you their broken strings dude. Usually the big strings don't break as much as the thin strings. I think I'll stick with the GS for now. Wouldn't know. I just usully smack my guitarist around the head & fetch myself a drink while I wait. I guess i could always ask my local serial killer. See if he has any spares. This post was last modified: 12-02-2008 12:58 PM by Tarrakk Blackhand. The Blunderbuss crew so far. 3 dudes with Thumb Tack hats. 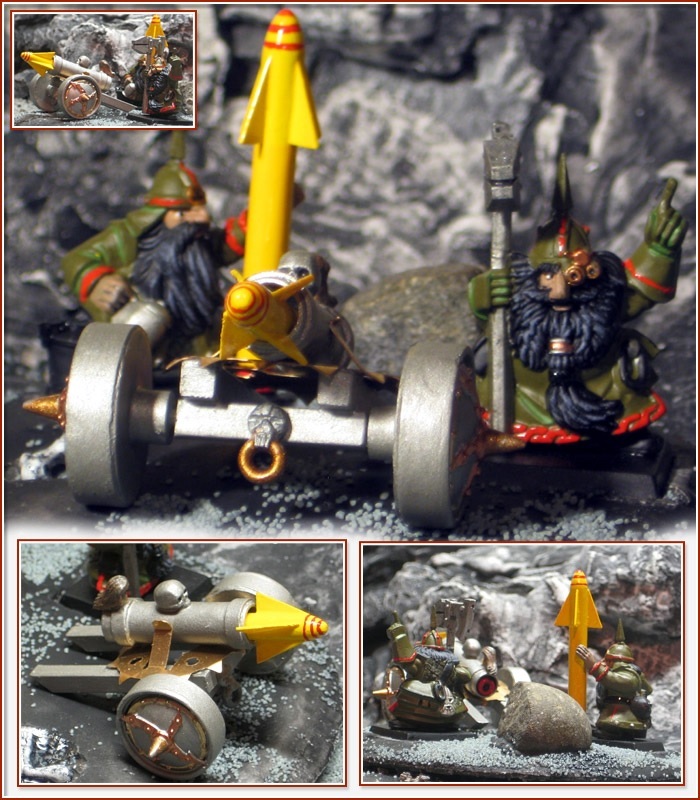 Chaos Dwarf Heavy Weapons crew - converted from BFSP Miners. Looks good! Looking forward to see them painted! ThanX Kera! I learned from the best! Tarrakk: Looking Great. Awesome start! How long did that take you by the way. And we might want to get the tip of the wires to anyone else new who wants to convert. Great idea, especially to figure out how "tight" you want the curls. Great progress, but as normal, we all want more! Well, today I finished puting the Thumb Tack hats on the Blunderbuss crew. The musician was tough because the instrument went right through his hat, so I cut some of the plastic away and replaced the horn with one from the Chaos Warriors. It has it's own, unique look to it. I don't think I'm going to change the hair on the Blunderbuss crew, just the armour and their guns. I might also remove the raised hand with the pistol and replace it with a different hand from the Dwarf Warriors. This post was last modified: 12-11-2008 12:34 AM by Tarrakk Blackhand. ThanX for the shield Kera!